Helpful San Diego Storage Moving and Packing Tips! Discount Movers hopes that these San Diego Storage moving tips will be very helpful for you with your upcoming move. The more you understand how to properly pack and load a San Diego storage unit, the better protected your furniture and home belongings will be. To prepare for storage in San Diego, completely fill your moving boxes to the top, even if you need to place crumpled newspapers to fill in the gaps. Moving boxes that are only half-filled tend to collapse, (both on the moving truck and inside of the San Diego storage unit) when anything’s placed on top of them. Filling your moving boxes to the top is the single most important packing tip you can learn for successfully storing and moving in San Diego. TIP #2: If you need access to items in storage, let your storage packers know so they can place these items in the front. TIP #3: Pack and Store 80% of your belongings into small and medium moving boxes: Small and Medium moving boxes are the most valuable size of moving boxes to protect your goods while you are in San Diego storage. Most items in your home should be packed in these boxes. This moving box can be used for almost anything such as books, CDs, VHS, collectibles, Silverware etc. These small and medium moving boxes are so important is because small boxes do not get too heavy for the movers to easily transport, they stack well in storage and in a truck, AND there is less probability of items moving around and breaking inside the box. Discount Movers recommends buying quality moving boxes to pack your belongings. Strong sturdy moving boxes are specifically designed for moving and storing. With stronger fibers and consistent sizes for stacking; moving boxes will not crush when stacked, they are easier to layer, and the uniformed sizing will help you get the most use out of your San Diego storage space. Call your rental insurance, homeowners insurance and/or moving insurance provider to see if your belongings will be covered while they are in storage under your policy. Most of the time there is no storage insurance options that are given by the storage provider. Be sure to keep an inventory of everything you place in storage. Click here for San Diego Moving Insurance Information. Chose the smallest San Diego storage unit you can fit your belongings into, and have your San Diego movers pack it to the ceiling. You do not want to pay for storage space you are not using. You might save a little money by loading your San Diego storage unit yourself, but professional movers know how to maximize space, which will, in turn, decrease your costs every month! It will also save you money if your belongings are safe and secure. Please note, most San Diego storage companies will have a calculator that you can use to determine the most appropriate size. Professional San Diego movers will place heavier items like drawers and wardrobes on the floor and lighter/fragile items on top. Fill all the spaces in your San Diego storage unit with soft items like bedding and towels. 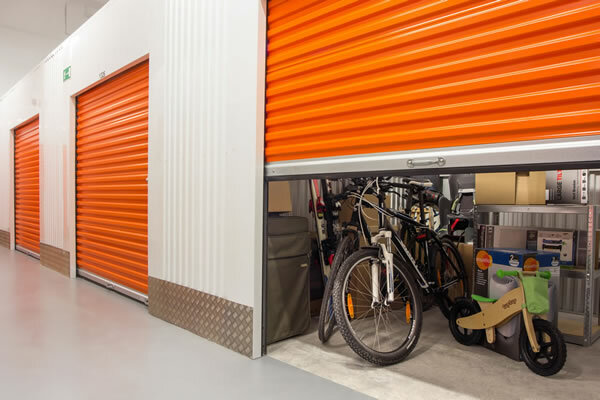 If you’re storing anything valuable in your San Diego Storage unit that could be sensitive to weather – ask about climate controlled storage units. Even though San Diego has a consistent temperature, some San Diego storage facilities can get very hot in the summer. Climate controlled storage restricts the temperature and the humidity. This can also help prevent mildew. The humidity in your San Diego self-storage unit can cause your furniture to warp and your appliances to mildew. Leaving small spaces between your belongings, inside of your San Diego storage unit, is helpful in creating circulation to prevent mildew. Chose a San Diego storage location that will be close to your new home if you are moving locally within San Diego and will need access to your belongings. Lay down plastic sheeting on the floor of your unit before your San Diego storage loaders arrive. This helps prevent dust. Tip #12: Decrease your San Diego storage moving costs and have a garage sale! Storage costs depend on the space. The more San Diego storage space you need, the higher the price. Therefore, it is a wonderful opportunity to hold a garage sale before you move into your new San Diego storage unit. To prevent mold inside of a refrigerator you are storing, keep the door slightly open. This helps prevent mold from growing. Tip #14: Moving out of California and need storage moving services in San Diego? If you are moving out of California and need storage in the meantime, you may want to consider using a company that enables you to load your belongings in a crate, store them, and then move to your new home. This is called portable storage. If you’re putting anything that is metal in a storage unit, such as tools, lawnmowers, appliances, it is best to put rust protector on them first. If you have a rag with oil, that can also work well. Most San Diego storage units will provide you with several different types of security. However, it’s still advisable to take a few extra precautions to prevent theft. Pack your San Diego storage unit so that your most valuable items are at the back and never label a box with “valuable items.” Lastly be sure to purchase a high-quality lock for your door. Tip #17: Place any valuables and fragile items towards the back of your San Diego storage unit. Anything you need “easy access” to should be placed inside of your storage unit LAST. Please label these boxes FRAGILE and write “PLACE IN BACK OF STORAGE” on moving the box to effectively communicate with your San Diego movers.